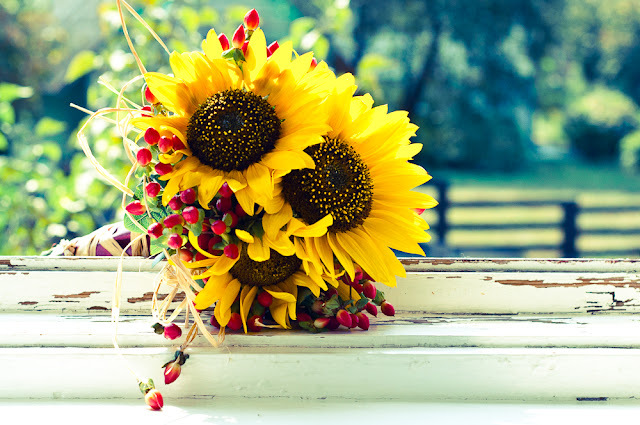 What flowers will go with sunflowers? and I would like to incorporate one other flower, preferably a light purple color. I was thinking maybe lavender roses? Having a hard time finding bouquets with those flowers together though, so not sure how it would turn out. Re: What flowers will go with sunflowers? I originally wanted a sunflower bouquet. I thought this was really pretty. I've seen a similar one with little tiny purple flowers, also, but I can't find the photo. 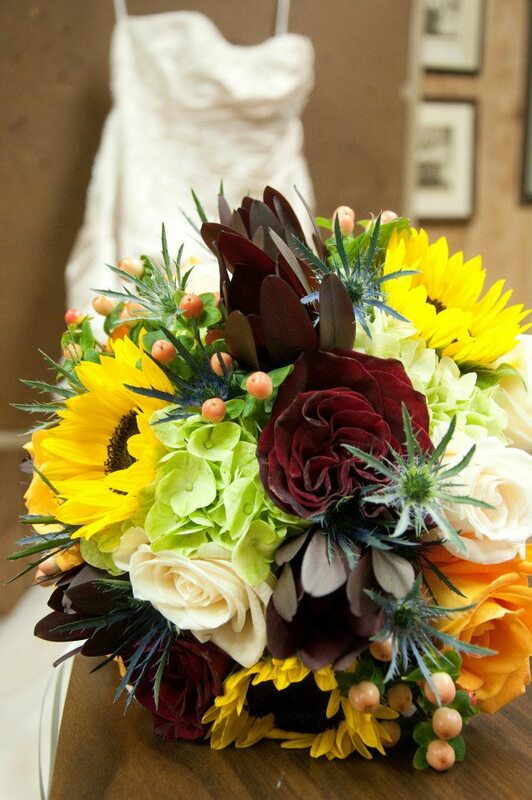 I had small sunflowers mixed with other flowers in my bouquet. My wedding was November and my colors were brown & ivory. I didn't want htem as a primary flower, but the photo will show you the variety of colors & types of flowers my florist mixed them with. @Erikan, It's pretty but too much for me. I'm set on doing the bouquets myself to save money. The more flowers you add, the harder and more expensive it becomes. I'd like to order just sunflowers, babys breath, the mix of larkspur to give it a wildflower feel, and one other type of flower. It doesn't have to be purple. It's just my colors are really only ivory and yellow, and I would like a pop of some other color throughout the flowers and decor. I'm getting married in May.